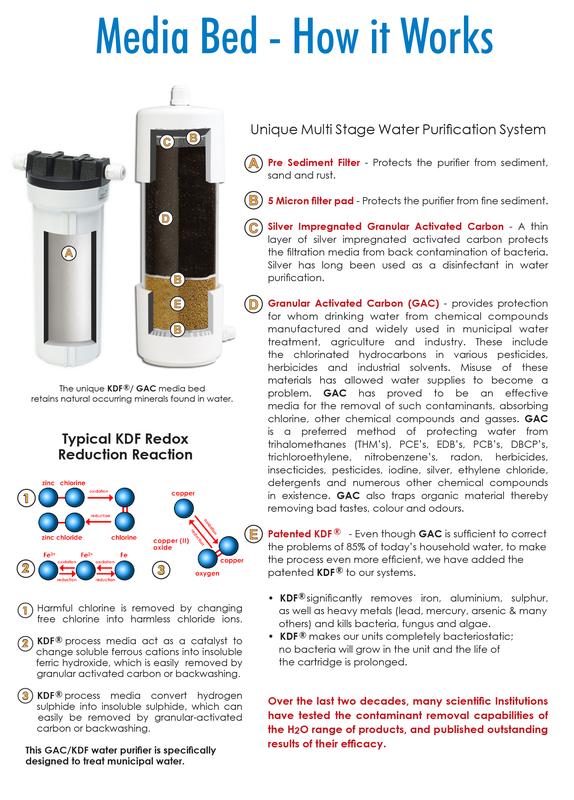 Point of Use Water Purification that will remove unwanted chemicals & metals. Why is water chlorinated in the first place? Municipal water is well treated and certainly safe from the real nasties like cholera, typhoid and other frightening water born illnesses. Water is treated with chlorine, aluminum sulphate and fluoride. There are good reasons for this, the most important one being to make the water safe to drink and keep it safe all the way from the municipal reservoirs to your home or office. “’It is the same as buying bread that is packaged in plastic,”’ says Tony Marchesini of H2O International S.A., “’the plastic keeps the bread fresh all the way from the bakery to the supermarket to your home. Why are H2O Purifiers the best in the world!